Excavation on the farm can be dangerous work. Hitting or damaging an underground gas or electric line can lead to potentially fatal results along with loss of property such as equipment and buildings. There are over 68,000 miles of pipelines in Minnesota carrying gas and hazardous liquids. Many of which are in rural portions of the State. This spotlight features Gopher State One Call, Minnesota’s one call excavation notification center, and highlights what can be done to ensure safe agricultural excavation practices. 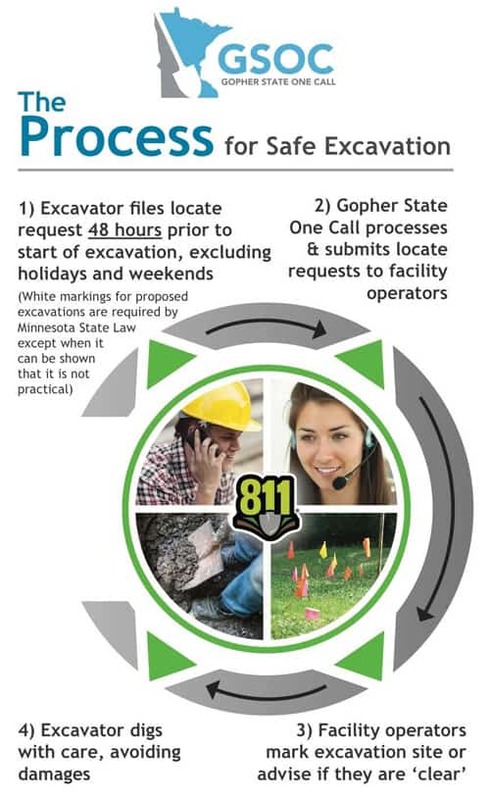 Gopher State One Call – Connecting Minnesota for Safe Digging. Dig Safely. Know what’s below by calling 811. The familiar phrase “Click or Call before you dig” is well known but why should I call when I know where everything is and the process just slows me down? I want to get the job done now. Let’s take a look at these questions and comments. Why should I call? The simple answer is that it is the law. Minnesota Statute 216D requires that anyone moving soil with a mechanical device is required to submit a One-call ticket to Gopher State One Call (GSOC). 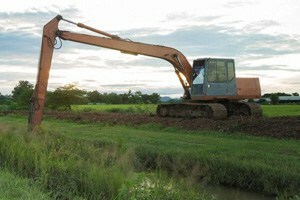 Yes, there are exceptions for agricultural activities but those exemptions are limited to ordinary planting, cultivation, plowing or harvesting 18 inches deep or less. In addition, more and more underground infrastructure is being placed in the ground by a method known as horizontal directional drilling (HDD) or trenchless excavation. You may not be aware of the location of newer underground facilities because there may be no surface evidence that they exist. What is the One Call process and how long does it take to be safe? 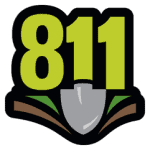 Call 811 forty-eight (48) hours prior to the start of the excavation, excluding weekends and holidays. The locate request can also be filed online at www.gopherstateonecall.org. Either way, the facility locate request is FREE. The cost of the request and the locating activities are paid by the utility companies to protect you and their underground facilities. During the 48 hours prior to the start of the excavation, not including weekends and holidays, the utility companies mark the location of the underground utilities or advise they are “clear” of the excavation area. Waiting the required 48 hours before starting the excavation is the time required to be safe rather than sorry. What underground facilities DO NOT get marked with a call to GSOC? With a click or call to GSOC, public facilities in the public road right of way get marked. The gas and electric lines up to the meter by the house also get marked. Private underground facilities, such as gas, electric and phone lines from the meter or house to outbuildings and equipment and privately owned farm taps and related lines, are NOT marked with a call to GSOC. These customer-owned facilities should be located by a private locating service. When new private facilities are installed, consider creating a detailed map, burying a tracer wire, or using above ground markers. Damaging a private facility can cause harm to persons, equipment and buildings in addition to being expensive to repair. What if I do hit something underground? In the event that you cause the release of gas or hazardous liquid, you are required by law to call 911 immediately. Let the first responders and experts handle the situation. If you hit electric, telecommunication, or other lines, call the utility company. The number to call can be found on the GSOC ticket. Always call 911 if someone is in need of assistance. Safe Excavation is everyone’s responsibility. This year, make each excavation a safe excavation! Call 811 to be routed to the call center in your area. Call 811 or file your request online at www.gopherstateonecall.org. Call 811 or visit call811.com/811-your-state for more information on your state’s 811 call center.